In the summer of 2017, Spark Placemaking began activating public spaces through Spark Lafayette-West Lafayette in partnership with and funded by the Cities of West Lafayette and Lafayette. This 16-week, two-city partnership activated public places in both downtowns with temporary public programming. In the past, West Lafayette’s activation took place during a time when the city’s primary thoroughfare, State Street, was closed for extensive construction. This business mitigation effort helped keep activity going in an especially secluded area where a thorough street was cut off to eventually create a small plaza. The items included at these pop-up public places included shaded and comfortable seating, chess games, corn hole, ping pong tables, giant chess, and giant Jenga for visitors to enjoy. The Spark team worked with local artists who are paid for their site-specific work. The project also employed two local staff members steadily on a part-time basis to program and manage the space with our team. Photos from this program can be found here. Spark Lafayette-West Lafayette began through connections with city leaders, made by Indianapolis-based developer Craig VonDeylen of Deylen and Blackline and by Eric Lucas of MKSK Studios. The cities then invited our Spark team to engage with the community and stakeholders, and to design and test ideas for programming in the summer and fall of 2017. 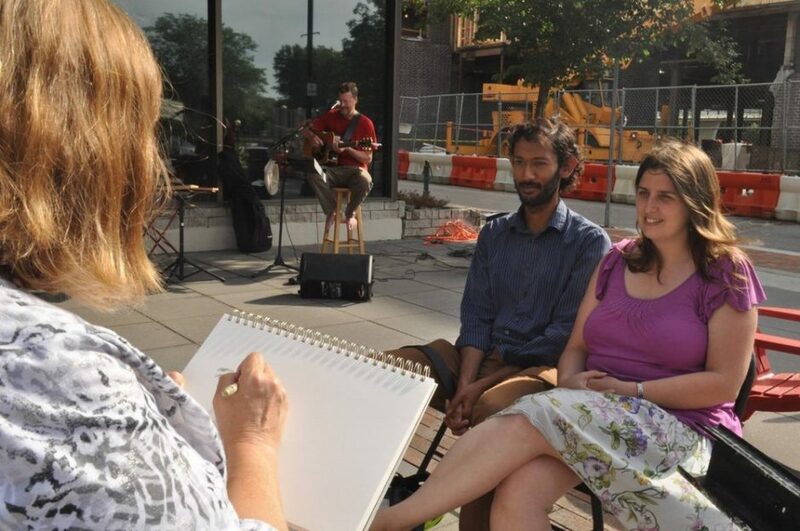 We scheduled programming with local artists in Chase Plaza in Lafayette on Tuesdays, and at a location where construction cut off a street to thru traffic in front of Greyhouse coffee shop in West Lafayette on Thursdays. The Spark team finished programming on Oct. 31, 2017. More information on the weekly programming can be found here. All programs were free and open to the public. Visitors enjoyed interactive activities such as yoga, live music sing-a-longs, magic shows, medieval crafts, balloon animals, bike maintenance courses, beekeeping demos, and the Spark Placemaking postcard project. The ongoing postcard project offered people a free opportunity to color and mail a postcard to anywhere in the world. Local Lafayette artist, Stacy Bogan, created two postcard images for Spark Lafayette-West Lafayette that visitors of all ages have enjoyed filling out and mailing. You can see the postcards here and here. Local Spark and Big Car staff were on site every day to interact with visitors through interviews, surveys, pedestrian counts, and assisting with local artists’ programming. In addition to activating spaces in both cities to increase foot traffic and visitation to local businesses, we worked with city staffers to partner with local businesses for the Spark Bucks program, which helped draw visitors into Spark corridor businesses. Local businesses offered a “Spark Special” that could be redeemed upon showing “Spark Bucks” and picked up at Spark pop-up sites in Lafayette and West Lafayette. The project has provided opportunities for residents and visitors to enjoy the great public spaces and businesses already in their cities; to participate in creative activities; and to socialize with others as well as enjoy new experiences. Read newspaper coverage of the project in the Lafayette Courier Journal here and here, and in WLFI here.